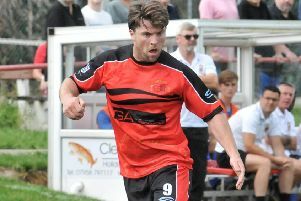 Garstang FC captain Gary Fawcett was left with an horrific injury after his cheek was ripped apart by a football boot. The 30-year-old was attempting to stand after a tackle when another player ‘ran over’ his face. He suffered a 6cm-long gash, which cut down to his jaw bone and needed 13 internal and 17 external stitches. Gary, an agricultural fitter, said: “A blade on the boot caught me on the chin and just sliced down. It wasn’t too painful at the time. “When you’re playing football your blood is pumping and the adrenaline is going. “I ran into the changing rooms straight away though – I knew something was up. “My friend drove me back to Preston, so I could be closer to home. The incident happened on Saturday as Gary captained Garstang, who were playing away against Eagley at Bolton. Gary, who lives in Preston, had scored one goal and assisted with another when he was injured 40 minutes into the match. At hospital he needed three injections in both the top and bottom of the cut before the stitches. “The stitches took a good two hours. I wanted him to take his time,” he said. “He’s done a really good job, but it was taking so long that the anaesthesia was starting to wear off. Gary now faces an 18 month wait to find out if he will be permanently scarred. His team went on to draw 3-3.
l For a full match report, see page 54.